She soon asks Daleiden what kind of volume he needs and the gestational ages. “[M]ost of the requests are actually 16 weeks and above, so you’re kind of right on the edge there, but I think it would be worth it to make the connection…,” Daleiden puts forward. Gatter agrees, stating that she has been a part of such arrangements before. “[M]ost people now seem to be doing per specimen,” Daleiden states. “What we’ve been quoting is $50 per specimen. I think some people are doing more, some slightly less,” Daleiden replies. “$50 is on the low end. $50 was like 12 years ago,” Gatter asserts. However, after confirming that Daleiden would send his own techs to remove the needed body parts from the premises, like other procurement companies do, she told him to give her a call to work something out. The full, unedited footage may be viewed below. 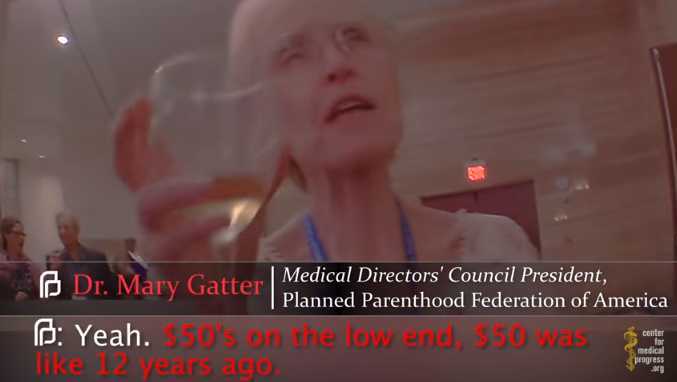 CMP states that the interview shows that Planned Parenthood was willing to receive payment per specimen—which is illegal under federal law—and that there are no “reimbursable costs” unlike the organization’s original argument to the media that it was not making money on the aborted babies themselves. “The U.S. Department of Justice should take heed of the Congressional investigations’ criminal referrals and prosecute Planned Parenthood to the full extent of the law, and taxpayers must stop being forced to subsidize Planned Parenthood’s criminal abortion empire,” CMP said.